These wonderful swirl shape glass drawer knobs are set in a bright brass base and have a have a diameter of 1 3/8" (35mm) and a projection of 1 1/2" tall (38 mm). 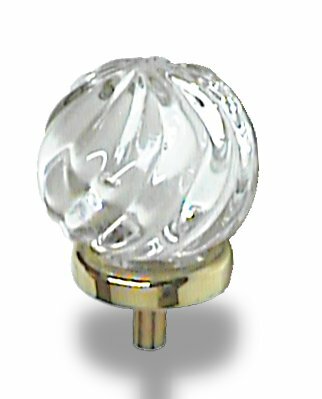 These fantastic glass knobs are sold individually and they come complete with the hardware, too. The bolts are 3/8 inches long. These glass knobs are perfect for kitchen cabinets and specialty drawer knobs.